It's tempting to think of Russia as nothing more than Moscow and St. Petersburg, even if you've never been the country. After all, the vast majority of the country's population lives in and between its two largest cities, and Siberia is super cold if nothing else. But Russia's Far East is a worthy destination, and not only because it's convenient (nonstop flights to Beijing, Seoul and Tokyo are available). The top 18 things to do in Vladivostok will surprise and delight you! Not too far back in time, however. Like most of modern Vladivostok itself, the city's fortress only dates back to the late 19th century, when the then-recent Russo-Japanese War made its construction a big obligation for the local government. At the very least, the Fort offers a beautiful view of the city and its harbor, not to mention a very brisk wind on all but the hottest summer days. Beloved by Russian people (but especially citizens of Vladivostok) for his 19th century explorations of what would become Russia's Far East, Vladimir Arsenyev is in many ways the reason the city exists at all. Trace his story by visiting related city attractions, such as Marakov Square, Hotel Versailles and of course, Arsenyev Museum. This is a great way to disprove the notion that Vladivostok, while younger than most major cities of Russia, has no heritage—it's got tons! If you're looking for a mix of Vladivostok's exotic eastern flair and its wild Arctic scenery, why not go for a boat ride in beautiful Golden Horn Bay? Boats depart from several places along the city's waterfront, and although this could be a chilly prospect in winter, it's always a picturesque choice, particularly around the time the sun is setting. You say you prefer terrestrial delights? Head north from the city center (and well away from the water) toward the Vladivostok Botanical Garden, which also serves as a research institute for the Far Eastern Branch of the Russian Academy of Sciences. Enjoy the company of thousands of different plant species, most of which exist indoor so that you can enjoy them year-round. Want if you want to enjoy Vladivostok's seafront, without actually going in the water? A perfect compromise is a stroll along the embankments of Amur Bay, which are beautiful year-round, but especially during the summer when locals take to them. A particularly beautiful sight from these shores is Russky Bridge, an ultra-modern cable-stayed marvel that connect the city's main peninsula with one of its islands. If, on the other hand, a boat ride is not an intimate enough ocean connection for your trip to Vladivostok, you could get even wetter—namely, by going on a stand-up paddle boarding trip. This is possible (though perhaps unadvisable) outside of summer, but if you get a warm day, you might be surprised just how enjoyable arctic water sports can be. Just make sure to get on shore before the sun sets (which is thankfully late, almost 9 p.m., in summer in Vladivostok). Certainly, cold water temperatures are no skin off the noses of any of the marine animals that call the Vladivostok area home. Of course, if you don't want to see them in the wild, there's an easier option: Primorsky Aquarium, which is architecturally stunning in addition to being home to cute (and talented!) dolphins. Twice per day, the dolphins put on a show, and though you can't swim with them (unless, of course, you stay in town and become a certified trainer), you might be able to get some face time. What's crazier than taking a boat ride or stand-up paddle boarding in Vladivostok? Well, depending on the time of year, going to the beach! To be sure, while actually entering the water can be a frigid proposition even in the summer, the golden sands of beaches like Kungasny Beach and Luzarnaya Bay are inviting places to sunbathe when the sun is bright in the sky. Even during the winter Vladivostok's beaches can be enchanting, particularly when the snow is falling. The bad news? There's only one pipe organ in Vladivostok. The good news? It's an epic instrument, both in terms of its sound and its story. See this behemoth in action at Most Holy Mother of God Catholic Church, and learn about its interesting life: An idea birthed in Austria, then designed and built in the Philippines before taking shape in Russia's Far East. Visit the church's official website (TIP: Use a browser that has a built-in translator, as an English-language version is not currently available) to see the full schedule and if it corresponds with your trip to Vladivostok. It's no secret that Siberian tigers are native to, well, Siberia, but you probably didn't realize that you could encounter the great cats (albeit somewhat domesticated ones) only a short drive from Vladivostok. Primorye Safari park is perfect for travelers who would love to venture deeper into Russia's wilds to see animals in their native habitats, but lack either the time or the fearlessness required. Did you know that Vladivostok's sister cities number 14, and include world cities like Busan, South Korea and San Diego, California? This fact is commemorated on plaques in the aptly-named Square of the Sister Cities, though you don't need to know history in order to appreciate the communal chill of this meeting point, which is beautiful no matter what part of the year you take your trip to Vladivostok. That Vladivostok is paradise for fishing is not a shock, given that the city is surrounded by water on nearly all sides. It might not be surprising, either, that fishing is an all-season activity, given what this list has taught you about how year-round a destination Vladivostok is. Still, if you have any interest in fishing, it might be worth your while to dedicate time to the sport, be it morning smelt fishing in winter, or a squid-fishing expedition on a summer night. Vladivostok isn't as old as many other cities in Russia, but its past hosted enough darkness that some of it manages to persist until today. Case in point is the Vladivostok Catacombs, which along with a variety of serpentine galleries and warehouses makes up an intricate underground world you'll be eager to discover, particularly during the cold months. If you search the internet for "photos of islands near Vladivostok," you might not feel like putting on a swimsuit—and that's fair. But whether you're able to look past the lack of tropical water and appreciate the turbulent surf of Kuril, or just happen to visit Popov Island on a sunny and relatively warm day, day tripping it to any of the islands near Vladivostok is a great way to disconnect and relax. Although Vladivostok's own soccer team isn't known for its win record (Luch-Energia's perpetually poor showings have become even more of a sore spot now that Russia's hosting the World Cup), the stadium they play at occupies a soft spot in locals' hearts. The city's new stadium, which is currently under construction on nearby Russkiy Island, will become the city's main one after the Cup has finished. If you've explored Europe, you probably know that Paris' Arc de Triomphe is far from the only triumphal arch on the continent—Bucharest and St. Petersburg, anyone? In fact, you can find a triumphal arch in Vladivostok, the Arch of Prince Nikolai, and while it's not as immediately iconic as Paris' (or even the one in New York's Washington Square Park), it features intricate painting and is definitely worthy of a selfie or two. Vladivostok is not only a current hub for Russia's navy, but has historically served as an important point of origin for seafaring Russians military vessels. Unfortunately, this means that many seamen have found their final resting place here. Why not pay respect to them at the Vladivostok Marine Cemetery? Even if you can't read Cyrillic and don't know the stories of the men who perished, it's still a worthwhile and solemn stop. If you've finished discovering Vladivostok (not that you can ever really finish) and still have some time left, take advantage of the city being the eastern terminus of the iconic Trans-Siberian Railroad, and embark on a westbound journey. 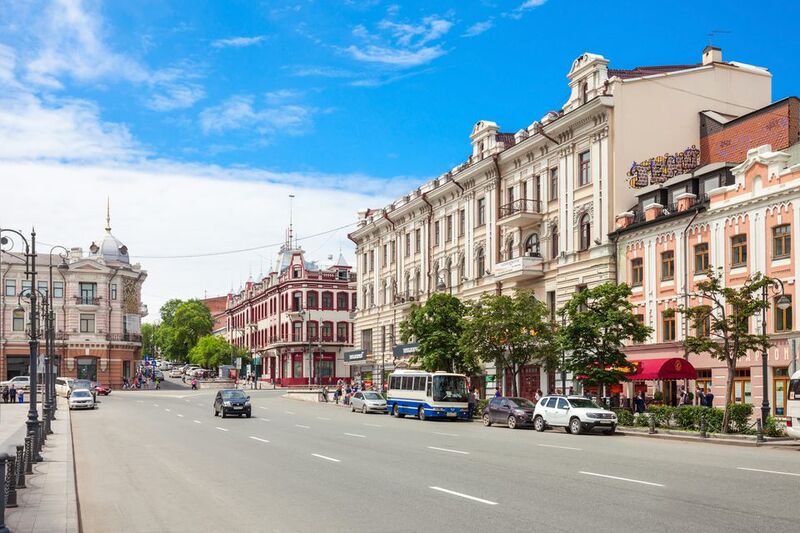 Whether you go all the way to Moscow, or stop in destinations like Beijing, Ulaanbaatar or Russia's fairy-tale city of Tomsk, Vladivostok doesn't have to be the end of your journey—it can be the beginning.